Hey everyone. This isn't Auburn-related, but I think you'll find it interesting. Jeremy Jarmon, a senior-to-be at Kentucky, had his amateur status stripped by the NCAA Friday for testing positive for a banned substance. The school held a press conference at 9 a.m. CDT Saturday to announce the NCAA's decision. Jarmon took a supplement that hadn't been approved by UK. These players are instructed very clearly to not put anything in their bodies without the staff's approval, so Jarmon was swimming without a lifeguard and he knew it. Poor decision, no doubt, but I feel bad for the kid. John Clay of the Lexington Herald-Leader liveblogged the press conference. Says he got a vitamin at a health food store. Said a supplement was recommended. He wanted only to purchase a vitamin. Said he also changed his protein shake from what UK provided. Says he told UK what he was taking, but it was too late. Hey everyone. So I made reference yesterday to a little feature we'll run here at the HABOTN for the next few weeks. Here it is. We'll start off with The Head Coach. That seems reasonable. I'll be altering the categories based on the coach. Guys without any ties with Auburn don't need their Auburn ties discussed. Right? If you have other categories that deserve discussion, mention them in the comments section. As you know, I abide the HOTTIES. College: B.A. from Florida, 1985; M.A. from Clemson, 1991. Playing career: Spent one season playing LB at Florida. 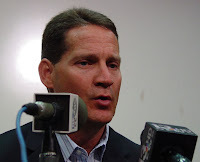 Chizik spent three seasons as Tommy Tuberville's defensive coordinator beginning in 2002. I considered him an upset winner for that job back then, which I figured would go to Chuck Pagano. He was one of Tuberville's buddies from U. Miami and, at the time, a defensive assistant with the Cleveland Browns. Chizik was a pretty private guy during his days as an Auburn assistant. He was thrifty with his words. I never got the sense he enjoyed speaking with reporters. Though I wouldn't describe him as unpleasant, Chizik was here to do a job and his focus on that task never seemed to waver. I'd still put him in the "C.E.O." category, but he's more moderate than Tuberville. While Tuberville gave his assistants little (if any) significant technical oversight, Chizik provides plenty of real-time input during practices and staff meetings. With that said, his most meaningful assistant jobs (Auburn, Texas) were associated with head coaches willing to concede varying levels of control. Chizik isn't a micromanager. He is an involved manager. Chizik employed 4-3 schemes at Auburn and Texas. I consider secondary coverages to be his specialty. Auburn's defensive backs were at their zenith during Chizik's final two seasons. They defended passes well, busts were sporadic and communication problems were rare. The Tigers didn't blitz very often. It's my belief that Chizik's abilities were most evident once David Gibbs made his one-year sortie in 2005 and Will Muschamp after that; the team's defensive backs clearly regressed in a number of areas. One could argue that not having Carlos Rogers around made a difference. Still, I gained a new appreciation for the technical side of Chizik's defense during Auburn's 2005 season. He's a reserved guy who analyzes the long-term ramifications of what he says. You won't get into a war or words with Chizik. He doesn't gossip. Even when CB Montae Pitts was acting a fool in 2004, earning a one-game suspension at one point, Chizik was remarkably reserved with his criticism. He's a vanilla kind of guy. He's aware of that image, though. I don't think it's a coincidence that outspoken guys like Trooper Taylor, Tracy Rocker, Curtis Luper and Jeff Grimes became members of the Tigers' staff. They offset Chizik's button-down demeanor. He reminds me of a military officer in many ways: Direct with his words, task oriented, unlikely to kill time with idle pursuits. Hey everyone. Jenna says hello. There isn't much going on. I wrote a swell running story for tomorrow's editions (with no Auburn angle) and that has been my focus for a few days. Running is good. It promotes health. I'll start a series looking at the coaches beginning Friday. I'll pick a guy, we'll examine his background, a memorable quote and my thoughts about the guy. You can disagree. I don't mind. So that's all I have to say right now. Hey everyone. 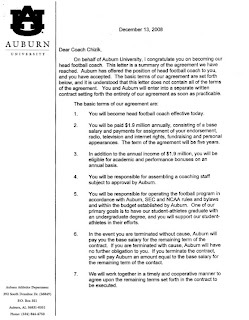 We knew Gene Chizik was making $1.9 million as Auburn's coach, but now we have proof of that agreement. NOTE: A proper contract, outlining Chizik's performance bonuses and other professional expectations, should be finalized before Media Days in late July. Hey everyone. Give John Pawlowski credit: He's working quickly to fill the Tigers' most obvious hole. 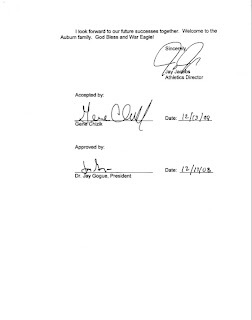 Auburn today signed a junior-college pitcher, Drew Madrigal of Mt. 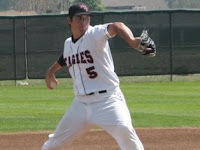 San Jacinto (Calif.) JC, to challenge for a rotation spot next season. Surely Auburn will be auditioning for every rotation and bullpen slot next season. Auburn finished its regular season with a 6.12 ERA. Hey everyone. Sorry for the lack of content here lately, but it's that time of year when almost nothing is going down at Auburn. I plan to do some stuff with the various summer football functions -- voluntary workouts and prospect camps -- but we need more than than to get us into late July. I can do scouting reports on Auburn's top 25 players or so. I'll probably run that beginning June 8th. That's sure to generate some commentary, but I'm still looking for ideas to supplement that. So now it's on you, HOTTIES. What do you want to read? 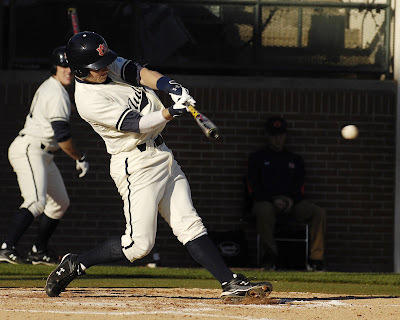 THE BASEBALL CONUNDRUM: Your Auburn Tigers ended their regular season with a series win (2 to 1) against Alabama. The Tigers are 31-25 overall, 11-19 against Southeastern Conference teams. The thing is: Auburn's RPI, the offical version from the NCAA, had John Pawlowski's team ranked No. 40 last week. The Tigers took two from Alabama and one from Georgia Southern since then. It's reasonable to assume Auburn will jump to No. 35 or so when the new numbers are released tomorrow. Will that be enough to make the NCAA Tournament? I don't think so, either. That hasn't stopped some people from speculating that Auburn's season may resume next week.